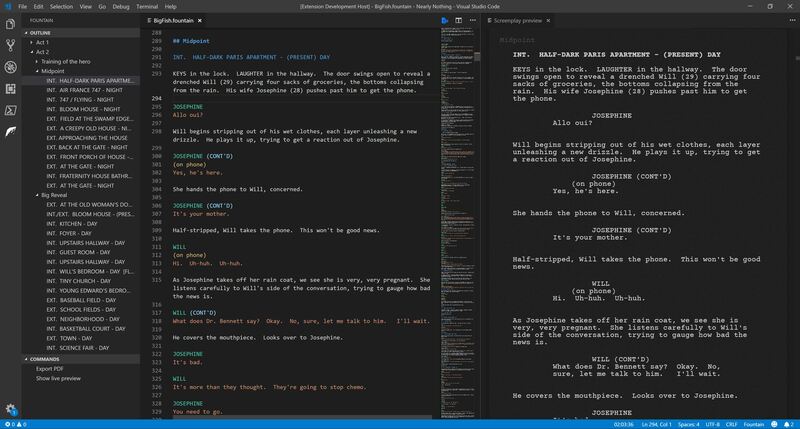 Visual Studio Code>Programming Languages>Better FountainNew to Visual Studio Code? Get it now. Autocompletion for recurring characters and scenes, as well as title page keys. Writing with fountain lets you focus on the essential. 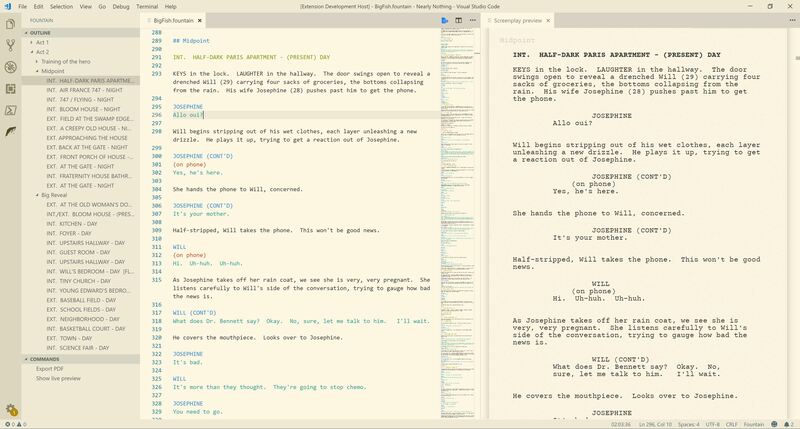 With the addition of autocomplete and syntax highlighting, you have the ultimate clutter-free ultra-fast solution for writing screenplays. And because it's an extension for vscode, it's free and cross-platform, and you get lots of other cool features like integrated source control. Just open a .fountain file in Visual Studio Code, and everything should work as expected. You can open the live preview and export to PDF by opening the command palette (Ctrl+Shift+P or F1) and searching for "Fountain". You can modify various options related to PDF Export in the settings, under "Fountain PDF Export". And to get an approximate duration of your screenplay, just look at your status bar, in the bottom right corner. Synchronized scrolling of the live preview with the markup. I will probably add these features when I have time, but if you're up for the challenge I'm more than happy to accept your pull requests. The project was built using Microsoft's language server example extension as a boilerplate. Why visual studio code? I thought this was about screenwriting? Done. Now you can create a file which finishes with .fountain anywhere you want, open it in vscode, and start writing! It's very easy to write a screenplay with fountain, but here's a good place to get you started.